The Rhode Island lawyer appointed to handle 38 Studios intellectual property has found "greater than expected interest" from bidders. The tale of 38 Studios' bankruptcy and closure is a long and grueling one, although some resolution was on the horizon with an upcoming intellectual property auction. I say "was", because now it turns out the process could take longer than we originally thought. According to Providence Journal, a lawyer appointed to handle 38 Studios company holdings wants to delay the auction due to "greater than expected interest" from prospective bidders. In 2012, Richard J. 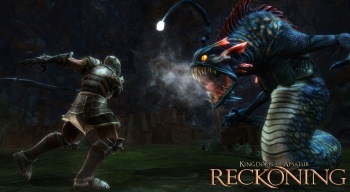 Land was appointed by a Rhode Island Superior Court Judge to auction off 38 Studios holdings, including Kingdoms of Amalur: Reckoning and the unreleased MMORPG Project Copernicus. Marketing for the auction began in September with intention of a holding an auction on November 14th. Land is now seeking a judge's permission to delay the auction date for a couple of weeks, which makes me wonder which bidders are interested in the properties. After all, bankruptcy drama aside, 38 Studios first game actually gained incredibly positive reviews. Several major publishers would probably love to make Amalur or Project Copernicus their own, but until the auction happens, we can't be sure which ones are willing to bid on them. 38 Studios physical goods, such desks, computers, and other holdings, have already been auctioned off to the tune of $400,000. Considering that auctions for videogame properties run in the millions, I suspect that the Amalur auction will be significantly higher.